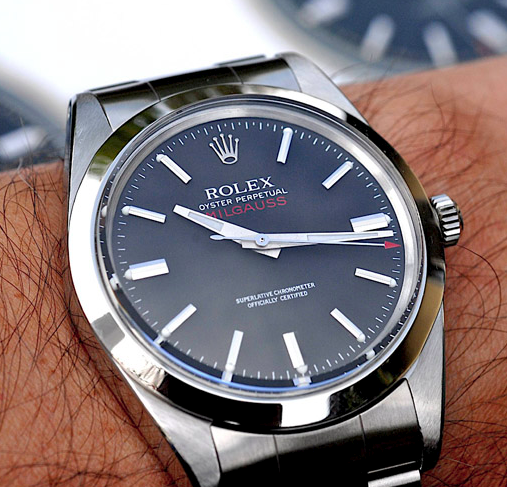 The first photo below is an old school 1980s Milgauss and the second image is a current Rolex Milgauss. The Rolex announcement at Basel of interest is the new Rolex Milgauss, so named for its ability to resist a magnetic field of 1,000 Gauss. If you take a mechanical watch into a strong magnetic field, some of the parts in the movement become magnetized which causes problems; typically the watch will start to run quite fast and require demagnetization. The hairspring, made of an alloy called Nivarox, is particularly susceptible. A watch is normally considered "antimagnetic" (DIN 8309) if it can ignore 4,800 A/m. This works out to about 60 gauss, or 6% of what the new Rolex is rated for. Rolex achieved the superior rating of the Milgauss by encasing the movement in soft iron, which is known as a Faraday cage. They also introduced a new hairspring material, Parachrom-Blu, which is unaffected by magnetism. Quite an achievement! 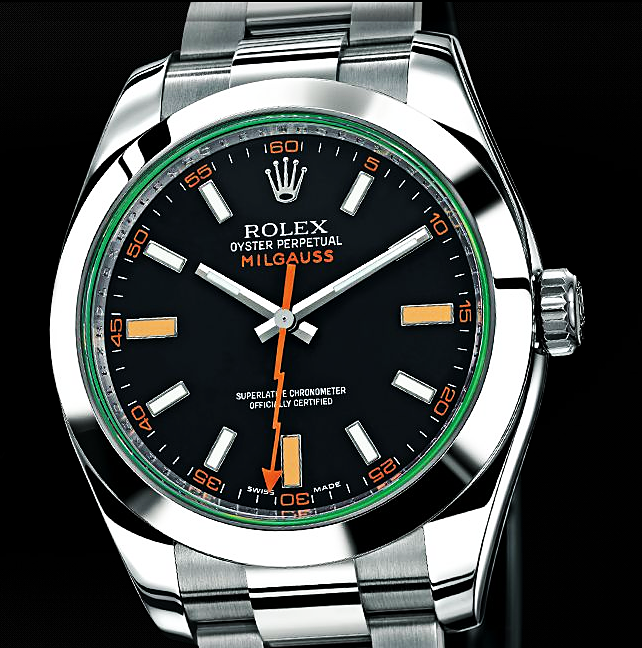 The Milgauss model has an interesting history. It was introduced in 1954 for people who worked in environments with strong magnetic fields: power plants, research labs, etc. As you might suspect, that's a pretty small market, further crowded by the IWC Ingenieur, the Patek Philippe Amagnetic, and the Omega Railmaster, all of which had similar magnetic resistance. The Milgauss was the slowest seller in the Rolex lineup, and was sold for about 20 years before being removed from their catalog. The Milgauss comes in the new, slightly larger case size of 40mm, with the 3131 movement. There are white and black dial versions available, both with a nifty and surprisingly modern lightning shaped second hand and 'ROLEXROLEXROLEX' around the face on the chapter ring. (As Christian noted, for better or worse, the new models are more heavily branded than their predecessors.) One difference between the two versions is that the black dial has a sapphire crystal that is slightly green at an angle, as you can see from the image gallery on their site. List price on both is rumored to be $5,900. One word of caution: for the new model, Rolex also lists "medical imaging" as a target market, but a bit of math reveals this to be disingenuous. Current MRI systems start at 0.3T and go up to 5T. Even the smallest of those is 3 times the rating of the Milgauss, so don't take your new watch into the MRI!